A deed in lieu of foreclosure is when a homeowner voluntarily gives title of the property to the mortgage company. A deed in lieu of foreclosure can help homeowners who are interested in walking away from the property avoid the consequences of a foreclosure. Lenders will often accept a deed in lieu of foreclosure to save money on legal fees and bring closure to the matter much quicker than filing for foreclosure. If you are considering negotiating a deed in lieu of foreclosure with your mortgage company, before calling your lender you should contact us to schedule a free consultation with a foreclosure defense attorney. A deed in lieu of foreclosure is not always a straightforward procedure and homeowners may still be responsible to the lender for the mortgage even after giving up title to the property. Typically, unless your deed in lieu of foreclosure agreement says otherwise, your lender may have the right to seek a deficiency judgment against you. A deficiency judgment will allow the lender to file lawsuits and take collection actions against you for the unpaid mortgage debt. At Florida Law Advisers, P.A., we take an aggressive approach with lenders to obtain agreements that will prevent our clients from facing the risk of a deficiency judgment. Our professional legal team has years of experience protecting homeowners and aggressively fighting greedy mortgage companies. Another area of concern for homeowners interested in a deed in lieu of foreclosure is the potential tax consequences. In most deed in lieu cases, there will be a forgiveness of debt by the lender, which is considered a cancellation of debt by the Internal Revenue Service (IRS). If the mortgage balance is greater than the market value of the home, the lender can issue a 1099C for the difference between the home’s market value and your mortgage balance. The 1099C reports the debt forgiven as income to the IRS, and you may have to pay taxes on the amount of debt forgiven. However, not all deed in lieu of foreclosures will result in the lender issuing a 1099C. You should speak with a foreclosure defense attorney to see if you may be exposed to the added tax liability. Homeowners have a lot of options when it comes to fighting foreclosure, and we want to make sure our clients choose the best strategic plan for their family. At Florida law Advisers, P.A., we explain all the options available to homeowners so that they can make an informed decision and avoid unwanted surprises down the road. 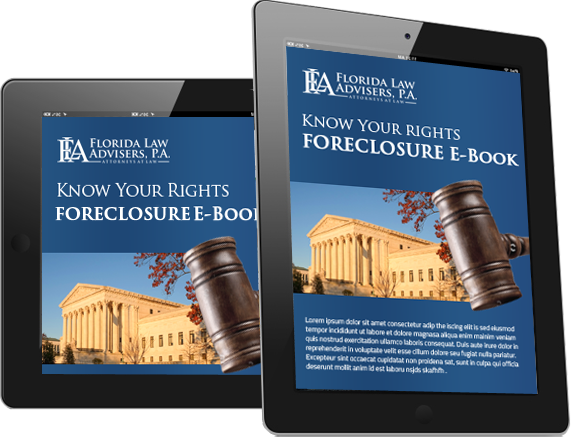 Whether you want to keep your home and prevent foreclosure, or walk away from the property without being responsible for any of the debt, Florida Law Advisers, P.A. can help. Our Tampa foreclosure defense attorneys have years of experience helping homeowners in all types of foreclosure defense and deed in lieu of foreclosure matters. Our foreclosure defense lawyers will carefully evaluate your individual situation, advise you of your options, and develop a comprehensive legal strategy to help reach your goals.